Robert Hall-Jutheau Auction, International Chinese Snuff Bottle Society Convention, Boston, 1991, lot 20. In Focus, a publication of the American Gemological Institute of America Alumni Association, Winter 1985/86, front cover. 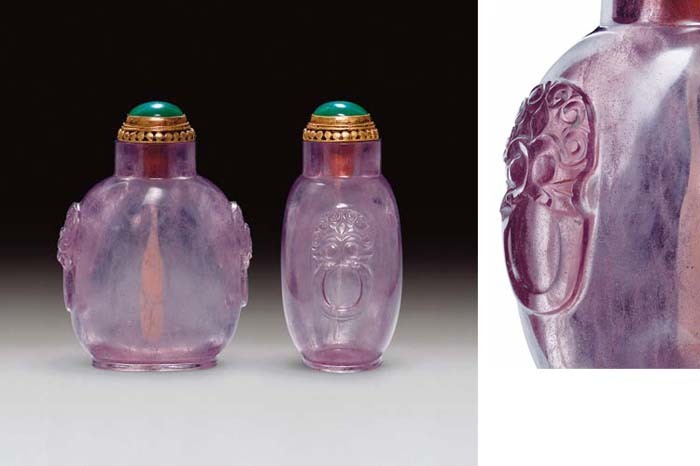 See a slightly larger, but otherwise very similar bottle, Moss, Graham, Tsang, The Art of the Chinese Snuff Bottle. The J & J Collection, no. 102. Crystalline quartz, whether colorless or of this amethyst variety, is sometimes found with a delicate network of markings resembling cracked ice or sea-spray. These appear here, and are found on other bottles of the same group (Moss, Graham, Tsang, The Art of the Chinese Snuff Bottle. The J & J Collection, nos. 95 and 96). The Chinese, with their passion for natural materials would have seen these "flaws" as inspiration for design and once filled with snuff, the inclusions would become more distinct, creating an abstract work of art.